The September Choir Newsletter is now available! There's a lot of information packed into this newsletter, including information on our upcoming Fall Concert, as well as our UnRaiser. Enjoy! 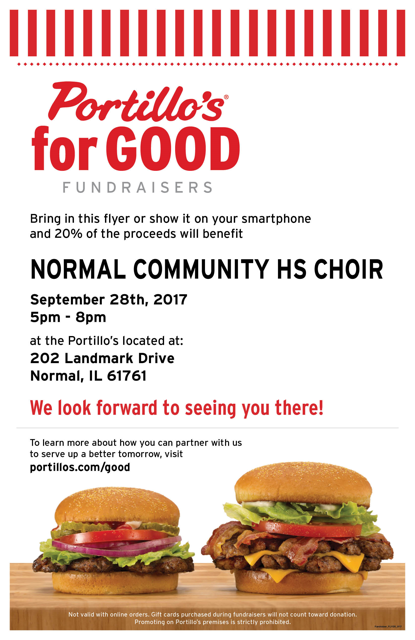 If you haven't been to the new Portillo's yet, reserve Sept. 28 on your calendar and visit between 5-8 pm for our NCHS Choir Fundraiser Night! 20% of your purchase will go to the choir program! Just bring in a copy of the flier or show it on your smart phone. Invite your friends and family to join us! All proceeds raised will be divided among the students attending the New York City trip in June, 2018. Hope to see you there!